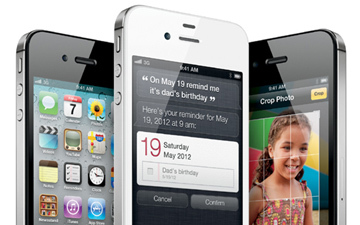 Apple has unveiled the iPhone 4S, the next version of its popular smartphone. It will be available for pre-order on Oct. 7 and available to purchase on Oct. 14. And like previous versions of the iPhone, the iPhone 4S will retail for $199 for a 16 GB model and $299 for a 32 GB model. The new iPhone looks much like the iPhone 4, confirming previous reports. It comes with upgraded internals, including the new Apple A5 chip and 1 GB of RAM. Apple VP Phil Schiller revealed that it will be the first iPhone with a dual-core processor and dual-core graphics. It is “up to seven times faster” than the previous iPhone, he announced. The device also contains a new antenna system that allows it to switch between two antennas for better sound quality and download speeds. The theoretical max of the iPhone 4S is a whopping 14.4 Mbps down, a vast increase from the iPhone 4′s theoretical max of 5.8 up and 7.2 down. The device also contains a new 8-megapixel camera that can take 3264×2448 images, an increase of 60% from the iPhone 4. It is capable of taking in 73% more light than the iPhone 4 and is 33% faster. It includes a redesigned Image Signal Processor that includes auto-face detection and 26% better white balance. It includes a new f2.4 lens for wider shots as well. Check out our live blog for more details about the new iPhone.